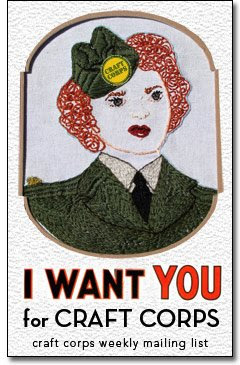 iLoveToCreate Blog: Craft Corps wants you!!! Have you checked out the inspiring Craft Corps site that is a celebration of the craft community?? It coincides with the release of Craft Corps: The Book, which comes out in May of 2010! Read all about the upcoming book here. The site gives you the chance to share your own personal craft story. Vickie is looking for inspired crafters of all ages and mediums! Share your story here. Share your story, become a part of the weekly mailing list, draft your friends, and read more stories of inspired crafters!